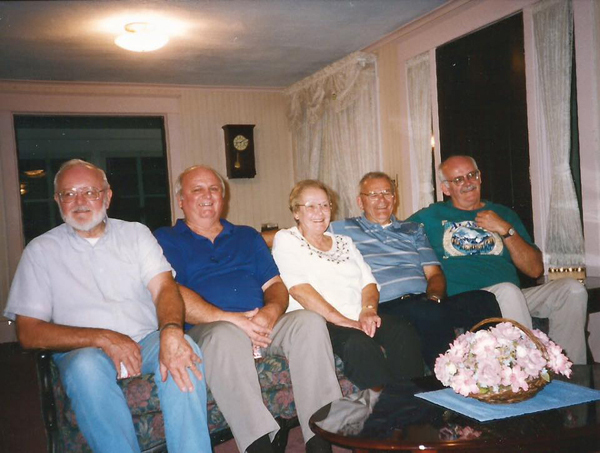 This is the last photo of the Mosher siblings taken together in Richburg NY (I believe in 2000) at Ray and Peggy Mosher’s home. Ray, (left) graduated from Portville Central School (New York) in 1948 and then went to post graduate school there for two years for, he says, so he could finally beat Bolivar in football. Ray and Peggy (now deceased) had 14 children. Ray worked as senior engineer at Dresser Rand in Olean, NY. David Mosher is next to Ray (both Ray and David are trying to hide their Budweiser beer). Ray graduated from Portville CS in 1955 as the all-time scorer in basketball. He is now 11th, I believe, on the list, but when you remember that scoring back in the 1940s and 50s were pretty low, that is remarkable. David also played football, baseball (catcher-pitcher and did the high jump in track and field for Portville. He should be in the Portville Wall of Honor, but as you know we have short memories and it’s been 63 years since he left for college, first at Syracuse where he played recreational ball against the famed Jim Brown, who David said could dunk the basketball from a standing start at the foul line. Brown went on to fame at Syracuse in football and Lacrosse. He played in the NFL with the Cleveland Browns and remains arguably the best running back in league history. Brown also did some acting in movies and has been a leading activist for blacks in America. David then transferred to Western Washington University in Bellingham, WA, graduating there in 1960. He then went into the Navy and became the radar man in the back seat of the F-4 Phantom II jet interceptor and fighter-bomber. He was on either the USS Constitution or the USS Enterprise for much of his service, showing the American flag at all the major ports in the world. He then became an engineer with Martin Grumman in Baltimore. He was involved in designing military radar systems, many of them secret. He once flew into the Navy base at Oak Harbor, WA where I met him. He couldn’t leave until he secured a black box he was tasked with taking to Anchorage. He and I left for two days on a beer-drinking venture. He never got out of his flight suit during this time, even though I tried to convince him to do so. David started his engineering career with Westinghouse, and at one time piloted the company jet. He now lives in Crofton, Maryland, with long-time wife Barbara, retired and enjoying the good life, some of it spent at the casino in Delaware where the horse races beckon to him. Minerva Mosher Dean is next. Minerva died in 2011 at the age of 81, just a few months short of 82. She graduated from Portville CS in 1946 at the age of 16, got married to Alvin Dean and raised five children — Ernie, Timmy, Alan, Elaine, Lee. Amy, the fourth child born, in 1953, died in 1958 of a brain tumor. Amy was a sweetheart. My last time with Amy was just before she died. I took her in a wagon around the Lillibridge Rd in Portville. By then she couldn’t talk and was blind, but she laughed and laughed and laughed as I raced with her around the Lillibridge Road. For weeks after Amy died, Minerva said she could feel Amy’s arms around her neck. Just before Minerva died in hospice care at home in Portville she said that Amy and Char (Ron and Barb’s daughter who had died in 1986) came and were sitting with her and were going to assist her to the other side. Minerva lived in Portville her entire life and all but Alan still live in the area. Alan lives in Houston. Minerva was my rock after our mother died in 1953 when I was just 19 days from being 13. If not for Minerva, I would not be alive now. She was my guide, my strength and loved me no matter what stupid thing I did. I miss her terribly. Ron (or Ronnie, as I call him) is next. Ron played basketball, baseball, football and ran track and field for Portville CS. He graduated in 1952 and is in the Portville Wall of Honor. He was a great high school athlete who just refused to lose. I have never beaten him in anything, although he cheated me one time in the photo football game we had. He says he didn’t, but he did. I was just 10 or 11 and he was too much bigger for me to win the argument. I was unbeaten in Ping Pong through college and one year I came back to Portville and visited Ron and Barb at their home in Cuba, NY. As I drove in their driveway, Ron greeted me and said, “You are just in time to play horseshoes.” Ron became a world champion in his age group and had a horseshoe pit out in his back 40. I knew better than to play him horseshoes, or anything for that matter. But I did spot a Ping Pong table that was set up in the driveway and I suggested with unusual bravado that we play that. I figured I was good enough now to beat him (because I never did when we played as kids). That is what thinking does for me. He beat me not once, but twice, before I decided to put quitting ahead of valor. To this day, I blame the losses on the wind that was blowing. Why not? I had to blame something besides me. Ronnie doesn’t remember this story, but I do. Charles Miller was my PE teacher and basketball coach (I played with the Portville Hornets middle school team) and also was Ronnie’s basketball coach. We students were still at the old Portville CS where the Portville Manor is now and one night I and a couple of buddies (I don’t now remember who they were) were walking in the parking lot in back of the school when we ran into coach Miller. He asked us guys if we ever saw any of his players smoking, to tell him. Being naïve kids, or at least I was, we said sure. Lo and behold I did see a player smoke some days later. I don’t remember now who it was, but I immediately did what I thought was the right thing and told coach Miller. That night I was in bed when I could hear Ronnie come storming up our steps upstairs. He started pummeling me in bed. He’s six years older than me, so this wasn’t some love tapping on the chest thing he was doing to me. I swear he would have killed me if I hadn’t done some quick thinking. I fell into the space between my bed and wall and laid still. Ronnie thought he had killed me, backed off, and went back down stairs. I survived. I never told anybody what happened, and either did Ronnie, but I learned a lesson: Don’t tattle-tale. Ronnie and Barb had nine children, three of which have now died ‑ Robin, very early, Char when she was 25 and in vet school at Cornell, and Kris, just a year ago after a long and painful battle with MS. Kris, though, was a trooper. She never complained. Ron has been a coach (25 years the football coach at Cuba), athletic director and teacher, and for 10 years drove a Blue Bird Tourist bus all over the East coast. He and Barb live in Warsaw, NY. Ron, who played semi-pro baseball while going to school at Brockport State College (NY), pitched two no-hitters at Portville. I’m next in the photo. My life has been full of ups and downs. I’m in the process of writing my life story. I doubt if I will finish it before life finishes me. I lived an idyllic childhood just three houses down on the left from the old Steam Valley Bridge in Portville going toward Olean. The hills, the Allegheny River, the meadows, the farms, the Colonial in Portville, those where I lived and roamed. Kick the Can, Hide-Go-Seek, climbing over the hill down the other side into Lillibridge where there are rocks as big as houses, picking wild blueberries alongside the railroad tracks, walking down the tracks and counting the ties and throwing rocks, man, those were the best of times. I have often called the Portville area Paradise, because it was and is. It’s difficult to find if you never have been there. You almost have to accidentally stumble upon it. But I have been in many parts of our country, and Portville is the best. The downside is that there is little there for a young man or girl intent on seeking economic opportunities. My idyllic life came crashing down when my mother ­– Jessie Elaine Mosher – died on May 21, 1953 from a bad heart valve. Nowadays, that valve would be fixed as an out-patient. Mom was just born too early. The day before she died in St. Joseph’s in Olean, she told our dad L.H. Mosher that Angels had come to her bedside and told her they had come to get her. She pleaded to give her an extra day so she could say goodbye to her husband and children. Ray was in Okinawa with bombers that flew over the Korean Peninsula during the Korean War and could not make it back, but she said her goodbyes that night before she died. I was pushed into her room as the last one. I didn’t want to go in. I was scared. I remember when I got in there she was sitting on the edge of her bed in a gown and had long white flowing hair. I had never seen her with white hair, so that shocked me. I don’t remember what she told me. I have prayed to God for years and years to let me know what she said. But I get nothing. She died the next morning. I remember clearly even now what happened. I was in Mr. Scott’s seventh-grade English class at the new school (now the old school). There was a knock on the classroom door. Mr. Scott answered it, and then came over to me (I was sitting on the last row, two seats in, near the windows) and told me I could go home. I didn’t know what was going on, but I got up and walked in front of the class and several of my classmates gave me the Bronx Cheer for being able to leave. Outside the door was my dad, my brothers Ronnie, and David, Minerva, and Barb, and I was informed by my dad that mom had died. The world that I knew from that moment on changed forever. Two things, and then I’m going to leave my story here. I may continue on with what happened in my life later. But, first, the day the funeral services were held at the house and then at the cemetery in Allegany, NY where the Mosher plot is, and we all came back to the house. At some point, I sneaked out the backdoor and climbed up on the dike. There was a row boat turned upside down on top of the dike, and I climbed underneath it. I didn’t cry. I just sat there in the darkness like I was in a void. There was nothing. Nothing. Nil. Nada. Soon I heard David yelling, “Terry, where are you?” over and over. Soon he got closer to where I was and then he gave up and went back down to the house. It was only a couple years ago that I thought to myself that David knew where I was, but decided to leave me alone, knowing what I was going through. I don’t know if that is true, but I now suspect it is. Anyway, I stayed under that boat for an hour before losing the battle with reality and knew I had to go back home. Minerva had decided to move in to help out with me and David, who is three years older than I am. It was the regular routine to come down from upstairs where the bedrooms where, and eat breakfast before going to school. Mom always had breakfast prepared and clothes out if she deemed we needed to change. I came roaring down the stairs and as I did I yelled, “Mama, what is for breakfast?” As those words instinctively came tumbling out, it hit me like a poleaxe that Mama was dead. I crumpled to the stairs sobbing. The first time in this ordeal that I cried. I stayed like that for maybe 30 seconds and then I heard Minerva say, “Mama’s not here. I’m here.” I slowly got up from my old life and walked down the final steps into a new life.